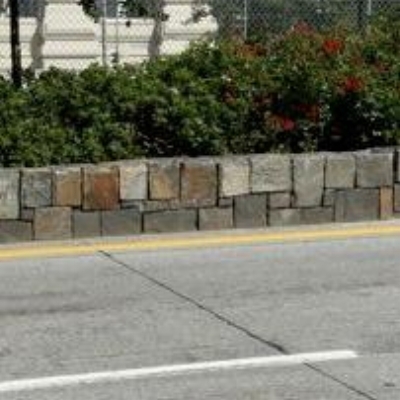 Hillside Stone & Garden has a large variety of stack stone which can be used for retaining walls, planters, garden boarders, or firepits. These products can be used drystack or mortared. No expereicnce is needed when drystacking because it is similar to a puzzle, very easy to backtrack and adjust when needed to execute your desired look. Stack stone, unlike pre-fabircated cement products, will not draw your attention to imperfections since any settling that occurs will just add character to the project. Please see the bottom of this page for tips and tricks on building a drystack wall or planter as well as an example of why we recommend stone over concrete.... Don't make the fake mistake! We carry a varity of wallstone in gold, silver and grey ranging in sizes averaging 2-6". The average coverage per ton is approximately 45 facial square feet. 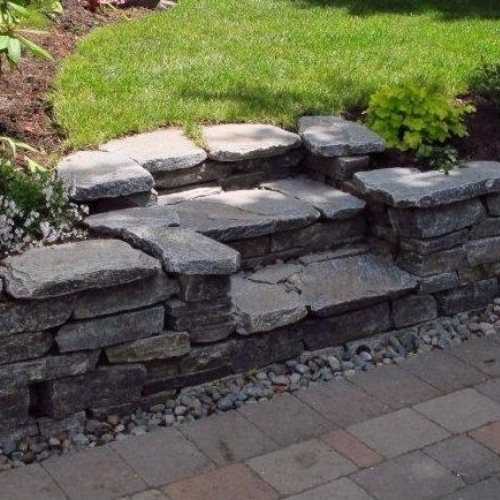 This product is great for creating small retaining walls which can be built freestanding up to about 2 feet and we also carry matching wallstone as well as flagstone for a consistent look to your backyard landscaping. The Mini Ledgestone is a smaller version of the above noted Ledgestone, ranging in size from 1-4" providing approximately 60-90 facial square feet per ton and is also available in gold, silver and grey. This product works well as a garden boarder. We carry large vairty of wallstone including the following colours: grey, green, sockeye, RMQ (tan) as well as a basalt ranging in size from approximately 4-12" deep and 3-8" thick providing approximately 30 facial sqaure feet per ton. A drystack wall can be built freestanding to a comfortable 3 feet, and higher with the proper backfilling. See below for some tips and tricks on building a drystack wall or planter or you can also come into our showroom and speak with one of the staff if you have anymore question. We would also be happy to recommend some reputable local contractors to do the work for you as well. 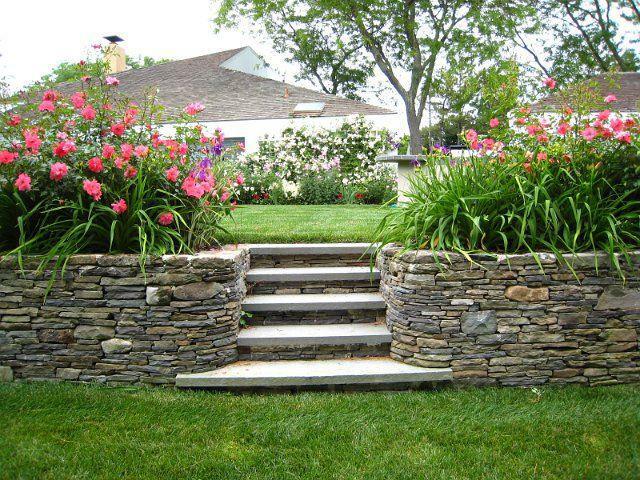 Another advantage to a natural stone wall is there is no footings needed. You simple begin by laying stones where you want to build the wall backfilling with dirt, sand or any other granular material as you go. You will want to compact each level with a hand tamper or compactoras well. Laying the stones as level as possible and by tilting the wall about 10 degrees backwards to prevent it from wanting to fall forward, it is possible to go up to 6 ft high. First, start laying the stones down where you want the wall then backfill each row as you go tamping behind the stone in order to compact granular fill ( this will allow drainage behind the wall but can be built without it depending on height). Next, place the second layer of stone on top of the first layer, but stagger the joints to give it more strength and character. Compact behind the stone, similar to the process on the first layer. A tamping plate or sledge hammer is best used for this purpose. Another option is a plate packer, available for rent at Hillside Stone & Garden. If you are using a granular fill, water will aid in the compaction process as well. I have no experience, do I need to hire someone? Most of the walls you see in our display pictures were done by a homeowner with no prior experience and in some spots they settled up to 2", can you tell where? - The short answer is NO, with a level and some patience and creativity you will be able to build a beautiful retaining wall, planter box, firepit or any other project you may have in mind with no problems or additional cost for installation. However, if you wish to pass on the job to someone else, we would be happy to recommend some local contractors to get the job done for you as well. Using natural stone instead of pre-cast blocks has a number of advantages. Natural Stone will not fade or bleed compared to a pre-cast block that would begin to bleed lime stains after just a year or two. After completion of your project, any settling that occurs will just add character to a natural stone wall whereas any settling that would occur in a pre-cast black wall will just result in cracks that can only be fixed by removing the wall to replace the cracked blocks, and of course the biggest advantage to natural stone is the wide variety of colour, size, and thicknesses to choose from instead of plain old grey cement. These photos below are an example of the results of settling, and this was installed by a professional.